Specialized and efficient devices in the field of industrial automation for transport and rail vehicles such as: Ethernet switches, industrial computers, antennas, routers, cameras, touch panels, industrial SSD - with EN50155 certification. E-paper is a environment friendly display. Thanks to the ,,bi stable" technology (constant position of electronic ink without the need for power supply) we have products which main feature is a low energy consumption. Reinforced and rugged equipment designed for harsh operating conditions typical for aerospace and defense projects. We provide solutions for optimal, reliable operation at sea, ground, in the air or in space. Ledatel company specializes in sales of components and elements of electrical and electronic equipment. We have been on the market since 2007 and we cooperate with domestic producers and foreign markets in order to create a complete and attractive offer for our customers, constantly expanding it new suppliers and new products. We offer specialized equipment in the field of industrial automation for transportation, rail vehicles, building automation, digital signage applications including Ethernet switches, industrial computers, routers, thermal printers, monitors, cameras, antennas, touch panels, industrial SSD. We also offer technical support in the configuration of the purchased devices. We provide the technical analysis of the project in order to select the appropriate device or solution. We present selected solutions for rail and road transport & industry. 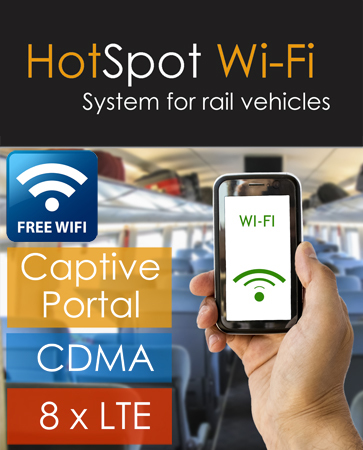 They can be part of: online diagnostic systems, passenger information, passenger counting, electronic payment system, video monitoring, hot spots Wi-Fi etc. Moreover, our offer include among others: wires and cables, connectors, obstruction lighting, passive components, semiconductors, electromechanical components. Extensive experience, flexibility and knowledge of the electronic market allows us to adjust our offer to the individual needs of each client.